Honey Bee Pollenator - California Trim Store Worlds best bud trimmers. The Honey Bee Pollen Collection & Trimming Tray is two helpful products in one. Finally gardeners have a feather-light laptop trimming surface that will separate flower pollen while manicuring. Our trays feature a comfortable nonslip base, 150 micron stainless steel screen and a pollen application brush. 100 micron white & 200 micron black stainless steel screens can be purchased separately. 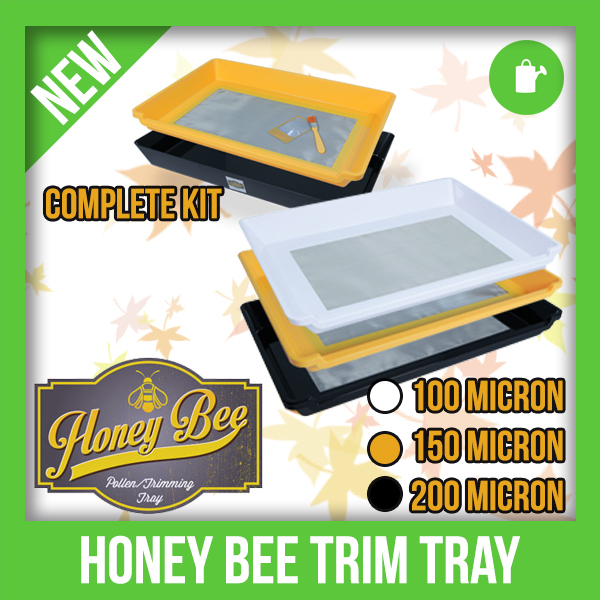 Honey Bee Trim Tray Complete Kit HONEY BEE POLLEN TRIMMING TRAY With The Honey Bee..
Honey Bee Trim Tray 100 Micron Tray Top The finest screen 100 micron & standard screen 15..
Honey Bee Trim Tray 150 Micron Tray Top 150 micron stainless steel screen and a pollen applic..
Honey Bee Trim Tray 200 Micron Tray Top The Black 200 Micron Tray will fit onto the Honey Bee..